The Willunga Basin Water Company operates a large reclaimed water scheme in South Australia. 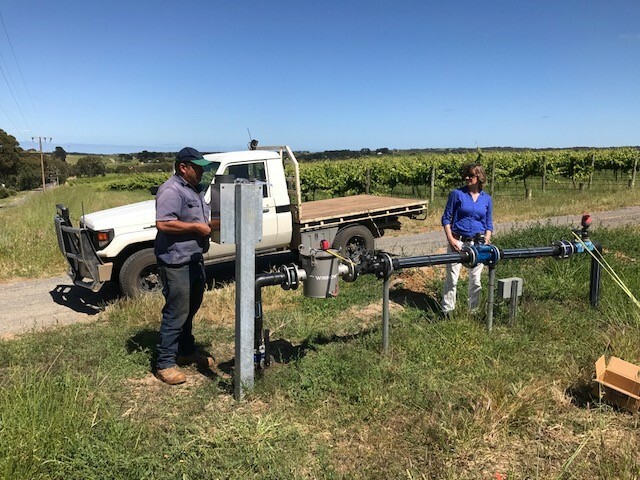 In the McLaren Vale Region, WBW provides vignerons with reclaimed water for irrigation, supplied primarily from the Christies Beach wastewater treatment plant. This scheme has been developed in response to many irrigators across the McLaren Vale region reporting a drop in the water table and an increasing level of salinity within their irrigation water supplies. The reclaimed water is cheaper than bore water and completely safe for drip irrigation. Users access the reclaimed water supply at a mutually agreed flow rate. Each outlet has a flow meter and water usage flow rate is logged continuously. There are significant fines for customers exceeding their maximum daily flow rate allowance of the reclaimed water. The problem for Wilpena Vineyards was to find a reliable method of ensuring that they did not exceed their maximum water usage over a 24-hour period. The proprietor, Mr John Trott, chose to install a Maric Flow Control valve at the connection, to ensure that the maximum flow rate 175 Kilolitres per day was never exceeded. The Maric valve was the only product available which could ensure this. John chose an 80mm Maric Wafer style valve, with a PVC body and a “Kwyflo” nitrile control rubber. The valve is rated at a flow rate of 162 litres per minute across the operating Differential Pressure range. The Kwyflo rubber is designed to limit operating noise while limiting flow rate. The valve was installed in 2016. Subsequently, data displayed on the performance graphs for monitoring water usage verified that the flow rate accuracy of the Maric valve was “spot on”. The valve has the additional benefits of being tamper-proof and maintenance free. This product has given them peace of mind in a fail-safe technology and saved the company significant over-use fines.